Sonic Free Riders is a game SEGA’s been keeping close to its chest until recently. Leave it to Sonic City Blognik’s AAUK to finally drop us some info! – The next track to be revealed has a Wild West theme, including waggon trains and a minecart section (MOAR MINECARTS!) where you actually have to pull a lever left and right to change the points and avoid rockfalls. It looks quite slick actually. – Someone’s return in the pre-race configuration screen is still gaining momentum! 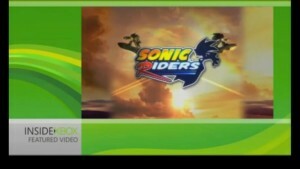 Rumour: Sonic Free Riders Coming To XBLA? According to a report from Joystiq a new Project Natal compatible entry in the Sonic Riders series will be announced for Xbox 360’s Xbox Live Arcade at this years E3 giving you the ability to play as your Avatar on one of the games Extreme Gears using the Natal’s motion controls. Microsoft will be holding a seperate show to their Press Conference specifically for Project Natal and it’s software so we’ll keep an eye out there for this title(if it’s real). Would you like a new entry in the Sonic Riders series? Let us know in the comments. Thanks to Tirann0 at the SSMB for the heads up! No other information has been revealed as of yet about Sonic Riders: Zero Gravity’s details except for the title. It’s not even yet known if it will be available for other consoles other than Nintendo Wii and Playstation 2 (Indeed, SEGA’S American and European sites make no mention of the game) but when we know, so shall you. So please stay tuned to The Sonic Stadium and Sonic News for more information as it breaks. Many thanks to Holy Nightmare on the Sonic stadium forums for the tip-off! Sonic Riders PC port announced! The newest availiable Sonic game for the newer-gen consoles — Sonic Riders — just had a new suprise announced in regards to it: A port to the PC! Like Sonic Adventure DX and Sonic Heroes before it, Sonic Riders will now be released in the near future on the Sega PC platform! While not many details are availiable yet as to if it will have any new features, or what the system requirements are, what we do know is that it’s a sure thing in the future, and will be on retail for $19.95 USD. If you were thinking of picking up Riders at all, this is probably your best chance at it, especially if you don’t have any of the consoles that the game is availiable for. Continue reading Sonic Riders PC port announced! Pleasing news for SEGA this morning is that their venture into the mobile phone game sphere has paid off well, with Sonic the Hedgehog spinning his way into the #1 spot on the official Mobile Phone Charts. ELSPA, the British association founded as a voice for the games industry, holds the latest charts figures in the UK every week, and their official mobile phone chart reveals that Sonic has shoved Tetris into second place, after the block-busting puzzler pipped the hedgehog to the post in February’s tot-up. Even though Sonic the Hedgehog mobile was only half of the Mega Drive version of Sonic 1, mobile fans seemed to lap it up, obviously experiencing shots of nostalgia when playing the game. In other chart related news, in an unsurprising twist Sonic Riders is still selling extremely well on the Nintendo Gamecube, maintaining the #1 spot since it was pretty much released. Its success may be pushed aside this week however after sales of the newly released FIFA World Cup Germany 2006 is added up over the last 7 days. The Japanese Sonic Riders website is offering the chance to download the Sonic Riders Extreme Gear. No silly, not real Extreme Gear, but miniature cardboard mock-ups. Head over to the Japanese Riders site, look in the gift section (It’s marked as ‘New’) and you’ll be directed to a page with Extreme Gear stencil sheets for download. All you need to do is stick the sheet on some card, a few snips here, a few folds there, glue, and you’re done. It’s amazing, and yet at the same time hardly surprising, but of all the Japanese animation studios out there SEGA landed ‘Production IG’ to work upon its anime intro for ‘Sonic Riders’. Sonic Riders interview, and SEGA go bananas! ‘Gamespy’ have conducted an interview with ‘Sonic Riders’ producer Takashi Yuda. Basically Yuda talks about already well know aspects of the game, so nothing new there. In other news SEGA has announced a brand spanking new game, and TSS has known about the game’s existences for sometime now. It was when visiting ‘SEGA of Europe’ that TSS stumbled upon some conceptual art, but the good people of SEGA vowed to “staple our nuts to a stack of paper, smack us in the face with an eraser” unless we promised not to spill the beans. And no, Eminem wasn’t really there. Continue reading Sonic Riders interview, and SEGA go bananas! SEGA of America have updated their long neglected Sonic Riders game page, finally unveiling some previously unknown game modes and officially confirming the rumored February 2006 US release date. All-new air board racing. New blend of snowboarding, surfing and high-speed racing combat. Innovative “Turbulence” air-system. Catch the drift of your opponents and leave them in your wake! Insane tricks. The more difficult trick you pull off, the more points you get! Shockingly enough, word has already found its way onto the internet of a sequel to SEGA/Sonic Team’s Sonic Riders, which is due for release next year. This information was brought forward by Takashi Yuda, the producer of Sonic Riders whose past work spans back from Sonic the Hedgehog 3 right through to Space Channel 5. Spanish gaming site confirms from SEGA the launch of Sonic Riders on the PSP. SEGA Japan apparently plans to release the upcoming Sonic racing game, Sonic Riders, for Sony’s Playstation Portable. 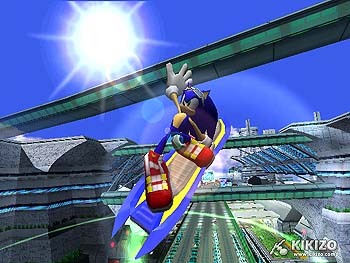 This means that Sonic Riders will be coming out for a total of four systems- Gamecube, Xbox, PS2 and now PSP. Kikizo, the games site, has recently added two new trailers for the upcoming Sonic Riders game, to appear on all platforms for the current generation of consoles, and new hi-res footage of the trailer that was first show at the TGS.